Most students have found the new coffee shop here in Georgetown, 309 Coffee. The shop is owned by three families. One of the goals is to not only sell coffee, but to create a community and a safe place for people to ask hard questions about Christianity. 309 Coffee is the beginning of a new church with new small groups. On March 14th, 2019, the first small group meeting began and was lead by Steven and Lyndsey Testone; they called it “Theology on Tap.” The meeting was mostly discussing how they could reach out to Southwestern students. There they decided to invite Southwestern’s College Young Life. Steven and Lyndsey moved to Cedar Park two years ago when Lyndsey had the idea of starting the coffee shop and creating their new church called “Nātiō”(from nāti·ō, -ōnis f ), which is Latin for a ‘tribe’ or ‘a people’. “We wanted to find a name that really reminded us that church is a people and not a place” Steven Testone explains. After Lyndsey mentioned the crazy idea of just packing up and making a new life, Lyndsey, Steven, and a few close friends spent 40 days of fasting and praying. They eventually found it was their calling to create 309 Coffee. They then sold their house within twenty-four hours, which was a big sign from God for the couple. Steven and Lyndsey do not really have a set and stone plan for their church, however. It seems that just getting started with the small business of 309 Coffee, which was remodeled all by volunteers, has pushed them in the right direction. “I’m passionate about theology, I’m passionate about tough questions and having conversations and I don’t think as a believer should be afraid of those [conversations]. I think we need to be a people that use our mind and ask questions,” says Steven. Lyndsey went on to say, “We want everyone to walk through these doors to feel known and loved wherever they’re at. We’re Christians and our purpose is to love people like Christ loves us and to see people through us, but it is never something we want to shove down people’s throats.” Lyndsey and Steven wanted to emphasize and to show that 309 Coffee is for anyone. They really want it to be a safe place whether someone is there for the coffee, studying, or to get to know Jesus. The small group wants to be a place where people of different denominations and anyone can bounce ideas off of each other and follow rabbit trails without any judgment. Hard questions that were asked by the students included: Feminism in the church, homosexuality, and Christianity, racism in the church, unity. They also mentioned how sin was defined in the Israelite days versus today, and science with Christianity. “Theology on Tap” wants to bring real life into the church. A student had mentioned that they liked being told “Jesus loves you,” however, it gets old, and going deeper into the why, how, and where He is, is nice to do as well. “Theology on Tap” wants to also talk about “what to do when you know that what someone is doing, is wrong, and how do you handle that?” says a member. “I think a topic should be, ‘how to love people well, even though we know they are not going down a path that is healthy for them. I have a lot of friends that sometimes can make bad choices and I want to love them, and they know I love Jesus so I want to represent Him well. [I have to] let them go down their path and figure it out for themselves, but I do not want to be self-righteous,” said one of the group members. These are just some of the examples that were mentioned during the group, however, “Theology on Tap” is welcoming more and more. 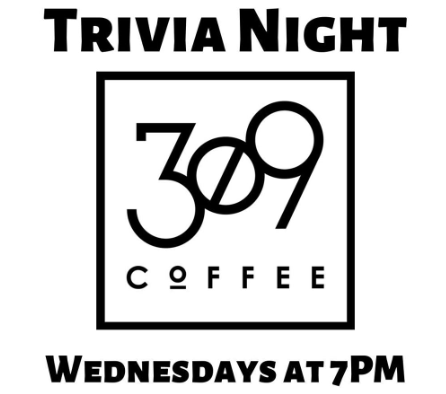 During the first meeting, Lyndsey and Steven also mentioned having some sort of Trivia Night, and recently, 309 Coffee announced a new way to get to know the community better: Trivia Night at 7 p.m on Wednesdays. 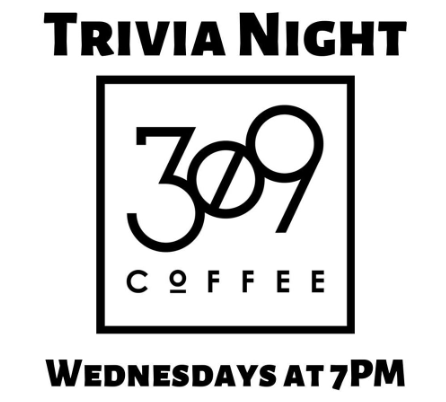 309 Coffee posts a clue Wednesday mornings to get participants excited for the event. The first Wednesday went well with some regulars showing up for a fun night of trivia. 309 Coffee hopes that this will spark a wave for more groups of people to come in and be a part of the 309 Coffee family. Whether it be joining “Theology on Tap”, or just enjoying some fantastic coffee, they hope to continue to build upon their community.